Thaksin University has been established with the intention of expanding educational opportunities to students in regional areas. At first, the extension of such opportunities has been operated by College of Education. The College of Education was founded on October 1, 1968. Later, its status was raised on June 29, 1974 as a university known as Srinakharinwirot University, Songkhla Campus. This was the first year that a four-year bachelor of education program was commenced. Afterwards, the university has gradually grown as time passes. Thaksin University realizes its responsibilities and work pertaining to educational management. The awareness is constantly possessed in order that developments of human resources are to be in conformity with the country’s development. In 1989, with the fact that 162 rais of the university areas in Khaorubchang Sub-district, Muang District, Songkhla Province was considered too small for supporting new faculties and the university’s future growth, the university areas were then expanded covering some areas in Phatthalung Province. 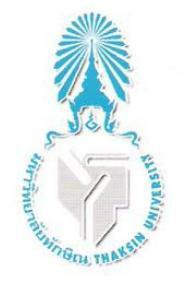 Thereafter, the university’s name has been changed to be Srinakharinwirot University of the South. Its work expansion has been continuously performed. However; to make that operation and administration of all sectors run more smoothly and faster, the university’s status was upgraded to be an individual university called “Thaksin University”. Thaksin University Act was approved in every step of the legal procedure and proclaimed in the Government Gazette on October 31, 1996. This was enforced on November 1, 1996. This day is recognized as the constitution day of Thaksin University. According to the Royal Command of His Majesty King Bhumibol Adulyadej, Thaksin University Act 2009 was enacted as an autonomous university and was proclaimed in the Government Gazette, Volume 125, Part 28 Kor, Page 47-71, dated on February 5, 2009. The Act was enforced from February 6, 2009 on. At present, Assoc.Prof.Dr. Somkiat Saithanu is the university president. Thaksin University has been focusing on the excellence of personnel and social development that emphasize on learning and awareness of global movements. Good quality of life and society has been achieved by integrating local wisdom, Thai indigenous knowledge, Eastern wisdom and international wisdom with academic knowledge. Thaksin University aims to establish the scholars’ knowledge, patience, moral, ethnic and skills. As this result, the development of quality of life, socialization skills and consciousness of natural resources and environmental conservation enable the Thaksin scholars reach the university’s goal. In addition, the university also intends to find out and develop the knowledge by researching the wisdom, Thai indigenous knowledge, Eastern wisdom in integrating with the international wisdom and transfer the knowledge to community through various academic service systems. Furthermore, Thaksin University also wishes to preserve the art and cultures to maintain the local and national identity. Faculty of Technology and Community Development. Faculty of Health and Sport. Faculty of Economics and Business Administration.